Spirulina is a blue-green algae, and although it is a food, it is better known as a dietary supplement. It is commonly touted for all sorts of health-promoting purposes and sold in both powdered and capsule form. Due to its nutrient profile, spirulina may be beneficial for certain thyroid conditions, but no clinical studies have confirmed its usefulness for treating thyroid disorders. Hypothyroidism, an insufficient production of thyroid hormones, is caused by a variety of factors, among them an iodine deficiency. Consuming a diet that is too low in iodine can cause your thyroid gland to become sluggish. Although the introduction of iodized salt has reduced the likelihood of having an iodine deficiency, many pregnant women in the United States and people who consciously avoid iodized salt are still low in it. Since your body cannot make iodine, you need to get it from dietary sources, and spirulina is naturally very high in it. As such, natural health practitioners sometimes recommend spirulina to help treat hypothyroidism; however, this recommendation is based on anecdotal evidence alone. Even though it has not yet been clinically proven to help fight hypothyroidism, the range of nutrients in spirulina make it a beneficial addition to a thyroid health-supporting diet. The potent antioxidant properties of spirulina may help prevent certain thyroid gland diseases by protecting the thyroid from the harmful effects of free radicals. Spirulina is also rich in a range of minerals including selenium, which is well-known for its thyroid-supporting properties. Finally, spirulina is an excellent source of protein and contains a healthy dose of vitamin B-12, which is helpful because many people with hypothyroidism are deficient in B-12. Some people are allergic to the iodine contained in spirulina, and you should talk to your doctor before self-medicating with it. This is especially important if you have a thyroid condition because too much iodine can be harmful for those with hyperthyroidism -- an overactive thyroid -- as well as those with Hashimoto’s disease, an immune system-related thyroid disorder. People who are most likely to benefit from spirulina are those with hypothyroidism or subclinical hypothyroidism, but even these people need to be careful, especially if they eat a lot of iodine-rich foods. A study published in 2012 in the "American Journal of Clinical Nutrition" found that while iodine usually helps stimulate the thyroid, too much iodine -- more than about 800 micrograms per day -- can actually cause the thyroid to become less active. Always buy spirulina from a trusted brand because it can be contaminated with toxic substances. 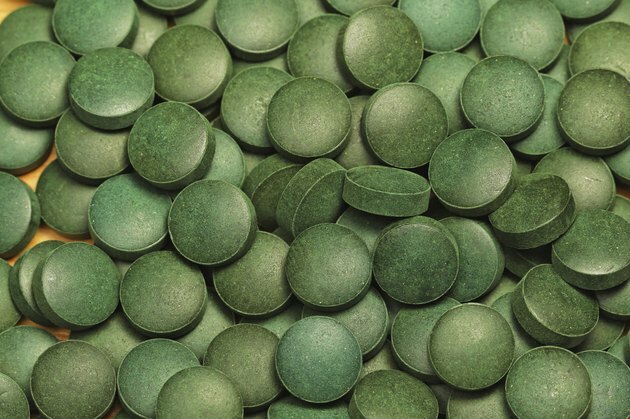 Also, depending on the water where it was grown, spirulina may contain high levels of heavy metals. A standard dose of spirulina for supporting health is 500 milligrams per day, but spirulina may interact with certain medications. People with the metabolic condition phenylketonuria should not take spirulina.